When you live in a climate where the winters are long and the snow piles up, you have no choice but to find a way to move the snow. A tractor-mounted snow blower is one of the best tools for the job! 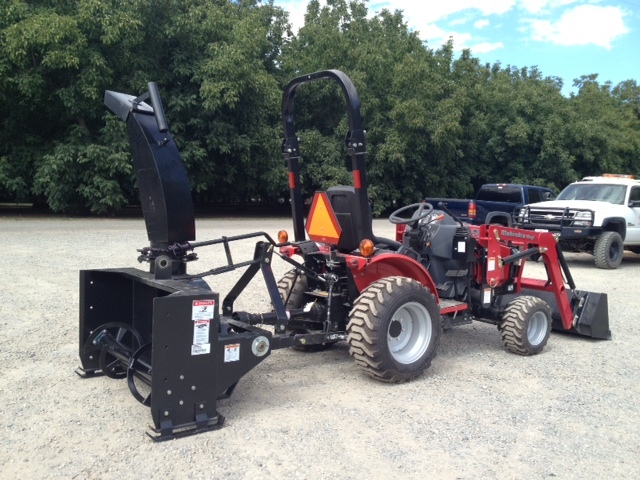 The simplest and most common option is the 3-pt mounted snow blower, powered by the tractor's PTO. As you push the snow blower into the snow, an auger pulls the snow to the center where a blower ejects the snow and shoots it out and away. We sell Braber and Terra Force snow blowers, with several options to choose from. Call today to discuss options and pricing! Unfortunately, we are currently out of stock on snowblowers. We will not be able to order snowblowers until next season. Please call if you'd like to discuss our snowblower options and arrange to get one for next year! Feel free to contact us with questions and to check availability. And if you're looking for something a little different, we can find it for you from one of our quality manufacturers! Pricing does not include applicable tax & fees.